It simply wouldn’t be a summer holiday without a little cold beer, would it? 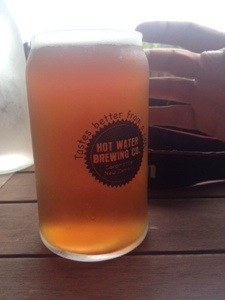 And luckily the remote, beautiful Coromandel Peninsula, the current holiday location, was happy to oblige us with the the Hot Water Brewery. 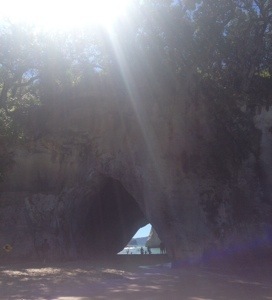 You find this little delight on the Tairua-Whitianga Road, nestled alongside the Seabreeze Campsite. Upon arrival, one of the brewers (Allan) provided taste-testing of a range of Hot Water Brewery’s beers. My favourite was the Walker’s Porter, which had a warm, full taste to my non-beer drinker’s palate. The Kauri Falls Pale Ale was also quite lovely and I imagine dangerously easy to drink on a Summer’s afternoon. Handily, Hot Water Brewery also has a brasserie attached. 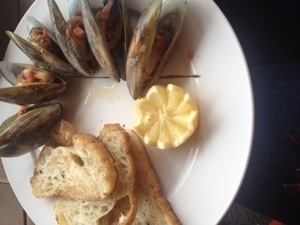 I ordered the fresh coromandel mussels with coriander salsa and they were heavenly. The mussels were plump and juicy and although I worried the coriander might be overdoing things, it was a perfect complement. 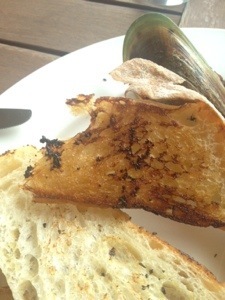 The mussels came with ciabatta bread, grilled and doused in some delicious olive oil. You’re lucky there is any photographic evidence at all, this meal was gobbled with lightening speed. The Mister had some very tasty grilled Gurnard and a generous portion of delicious chips. But no food envy from me. 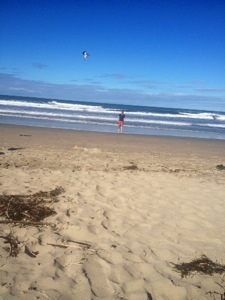 Anyway friends, I have more holidaying to be getting on with. Happy eating and keep safe.